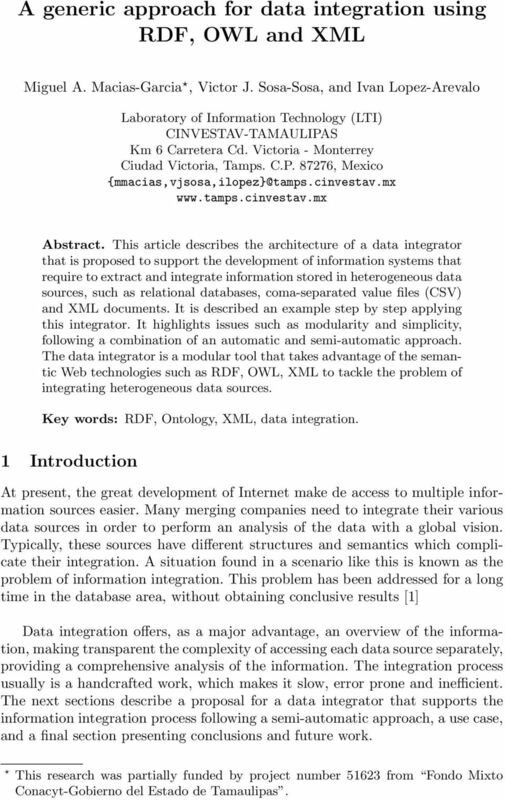 Download "A generic approach for data integration using RDF, OWL and XML"
1 A generic approach for data integration using RDF, OWL and XML Miguel A. Macias-Garcia, Victor J. Sosa-Sosa, and Ivan Lopez-Arevalo Laboratory of Information Technology (LTI) CINVESTAV-TAMAULIPAS Km 6 Carretera Cd. Victoria - Monterrey Ciudad Victoria, Tamps. C.P , Mexico Abstract. This article describes the architecture of a data integrator that is proposed to support the development of information systems that require to extract and integrate information stored in heterogeneous data sources, such as relational databases, coma-separated value files (CSV) and XML documents. It is described an example step by step applying this integrator. It highlights issues such as modularity and simplicity, following a combination of an automatic and semi-automatic approach. The data integrator is a modular tool that takes advantage of the semantic Web technologies such as RDF, OWL, XML to tackle the problem of integrating heterogeneous data sources. Key words: RDF, Ontology, XML, data integration. 1 Introduction At present, the great development of Internet make de access to multiple information sources easier. Many merging companies need to integrate their various data sources in order to perform an analysis of the data with a global vision. Typically, these sources have different structures and semantics which complicate their integration. A situation found in a scenario like this is known as the problem of information integration. This problem has been addressed for a long time in the database area, without obtaining conclusive results  Data integration offers, as a major advantage, an overview of the information, making transparent the complexity of accessing each data source separately, providing a comprehensive analysis of the information. The integration process usually is a handcrafted work, which makes it slow, error prone and inefficient. The next sections describe a proposal for a data integrator that supports the information integration process following a semi-automatic approach, a use case, and a final section presenting conclusions and future work. This research was partially funded by project number from Fondo Mixto Conacyt-Gobierno del Estado de Tamaulipas. 3 mapping between the two schemas, called the outcome of the correspondence. Each element specifies a mapping relationship between any of the elements of the source S1 with elements of the source S2. There are many issues to be considered in this process, some of them are: attribute name similarity, data type similarity, semantics, etc. Duplicates detection: The next step in the process of data integration is the duplicates detection, also called records linkage or references reconciliation. This stage identifies multiple representations of the same object in the real world. This detection is performed by comparing each pair of objects of different sources, looking for a level of similarity to establish a threshold, where the threshold is exceeded then we found duplicate items. At this stage two metrics can be evaluated, effectiveness and efficiency. The effectiveness is given by the quality of the similarity algorithms and the threshold parameter used to calculate the similarity. Efficiency is determined by the size of the data set and the runtime similarity algorithm. The result of the duplicate detection process is the assignment of an identifier for each object representation. Two representations with the same identifier indicate duplicity. Data fusion. The final step is to make the union of the records obtained through a global schema in the schema mapping. This process includes attributes renaming, restructuring and detection of inconsistencies. As we can see, the integration process includes various stages that lead to a complete data integration. 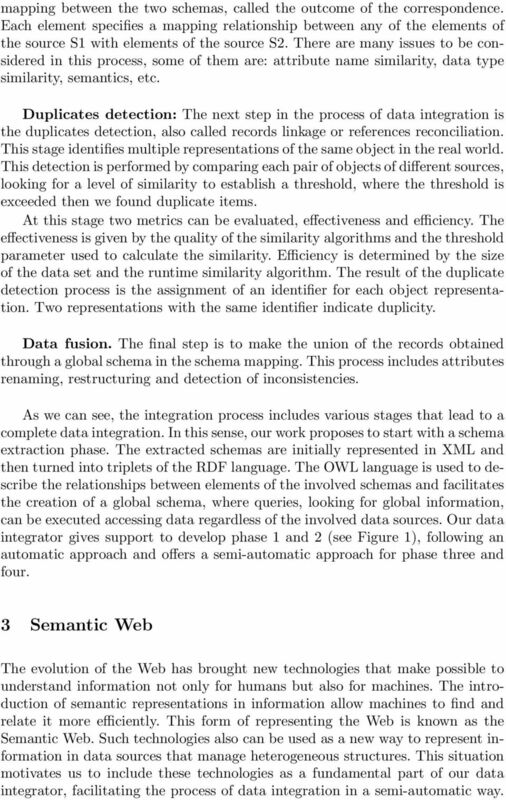 In this sense, our work proposes to start with a schema extraction phase. 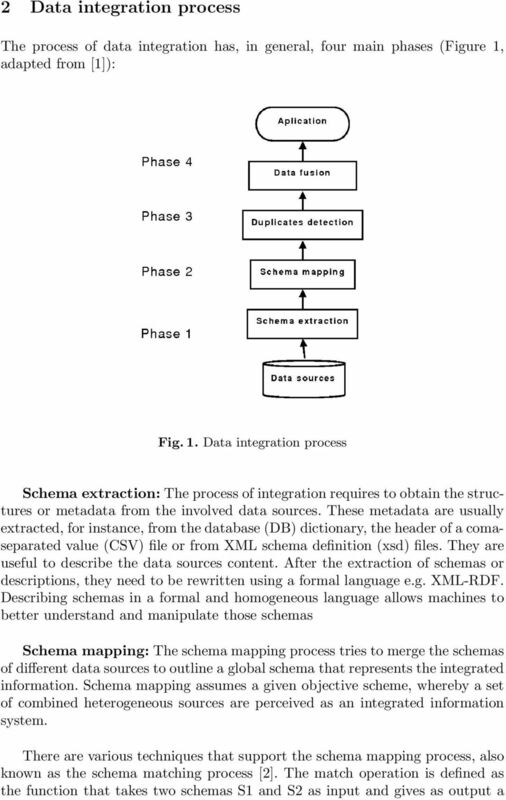 The extracted schemas are initially represented in XML and then turned into triplets of the RDF language. The OWL language is used to describe the relationships between elements of the involved schemas and facilitates the creation of a global schema, where queries, looking for global information, can be executed accessing data regardless of the involved data sources. Our data integrator gives support to develop phase 1 and 2 (see Figure 1), following an automatic approach and offers a semi-automatic approach for phase three and four. 3 Semantic Web The evolution of the Web has brought new technologies that make possible to understand information not only for humans but also for machines. The introduction of semantic representations in information allow machines to find and relate it more efficiently. This form of representing the Web is known as the Semantic Web. Such technologies also can be used as a new way to represent information in data sources that manage heterogeneous structures. This situation motivates us to include these technologies as a fundamental part of our data integrator, facilitating the process of data integration in a semi-automatic way. 5 to do useful reasoning tasks with these schemes, the language should go beyond the semantics of the basic RDF schema known as RDF-S. Reason why OWL is proposed as a good solution. 4 Data integrator architecture Figure 2 shows the process flow diagram that is followed in the data integrator. Fig. 2. 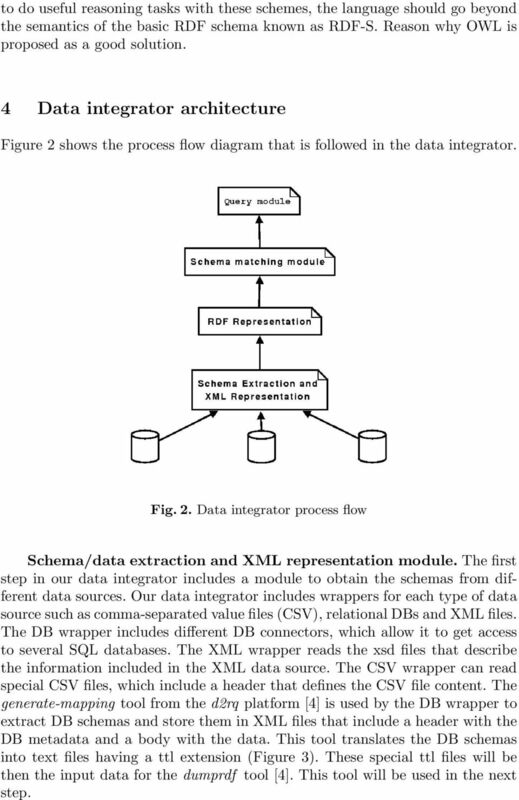 Data integrator process flow Schema/data extraction and XML representation module. The first step in our data integrator includes a module to obtain the schemas from different data sources. Our data integrator includes wrappers for each type of data source such as comma-separated value files (CSV), relational DBs and XML files. The DB wrapper includes different DB connectors, which allow it to get access to several SQL databases. The XML wrapper reads the xsd files that describe the information included in the XML data source. The CSV wrapper can read special CSV files, which include a header that defines the CSV file content. 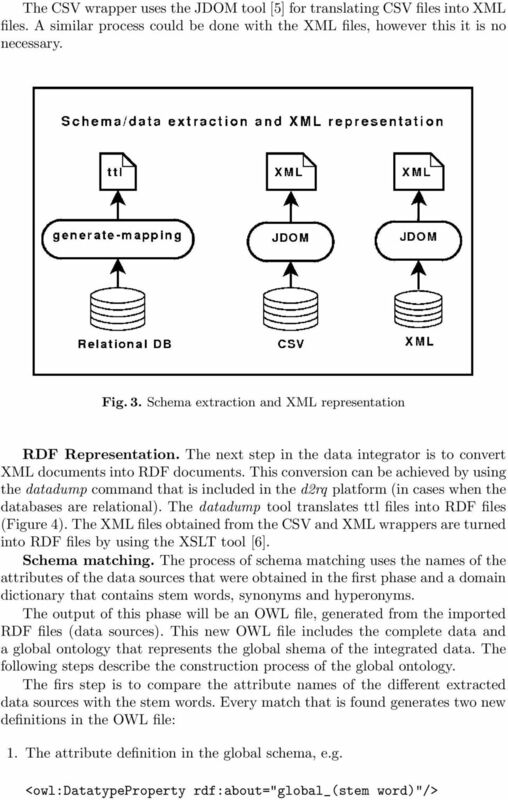 The generate-mapping tool from the d2rq platform  is used by the DB wrapper to extract DB schemas and store them in XML files that include a header with the DB metadata and a body with the data. This tool translates the DB schemas into text files having a ttl extension (Figure 3). These special ttl files will be then the input data for the dumprdf tool . This tool will be used in the next step. 7 Fig. 4. Converting XML data to RDF 2. The equivalence relationship between the original attribute (attribute of the data source) and the global attribute (attribute included in the global schema) e.g. <owl:datatypeproperty rdf:about="global_(stem word)"> <owl:equivalentproperty rdf:resource="(domain)_(attribute)"/> </ owl: DatatypeProperty> If an attribute does not match with a stem word, a search in the synonyms and hyperonyms bases is triggered. If a match is found in th synonyms base, the stem word (of that attribute) is obtained and a new equivalence relationship is generated. If the match is in the hyperonyms base a new subproperty relationship is created. An example of subproperty relationship is as follows. <owl:datatypeproperty rdf:about="domain/(attribute)"> <rdfs:subpropertyof rdf:resource=" word)"/> </owl: DatatypeProperty> If there is no match with the stem, synonyms or hyperonyms word, the Jaro Winkler distance  is applied between the stem word and the attribute name. When the distance exceeds a defined threshold (0.8), an equivalence relationship is automatically generated. Otherwise the original attribute name is included in the global schema. Query module. At this time, the final information base is a combination of all triplets and the global ontology. This information could be queried through a sparql  module (Figure 6). For this reason, the data integrator includes the use of a sparql engine called pellet  that takes advantage of the ontology characteristics included in the RDF document provided by the OWL language. 9 Fig. 7. Tables of patients taken from two differents data sources. 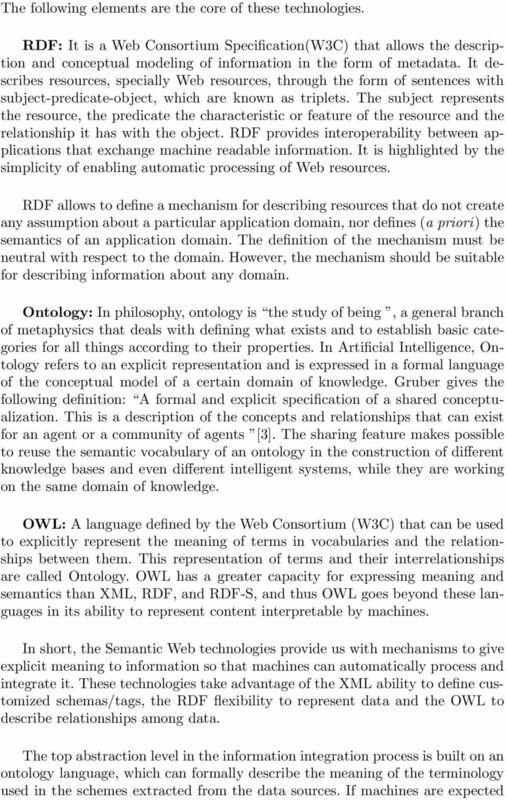 schema as an ontology in OWL, wherein the involved sources are imported. The following example shows some statements of the resulting global ontology. Patients.FirstName is equivalent to Sufferer.Name Patients.LastName equivalent to Sufferer.lName Patients.weight is equivalent to Sufferer.weightPat Patients.height is equivalent to Sufferer.stature Sufferer.street is subproperty of Patients.address Sufferer.stNumber is subproperty of Patients.address Sufferer.cityArea is subproperty of Patients.address Finally, we build a global RDF data base that combines the content of the two data sources. 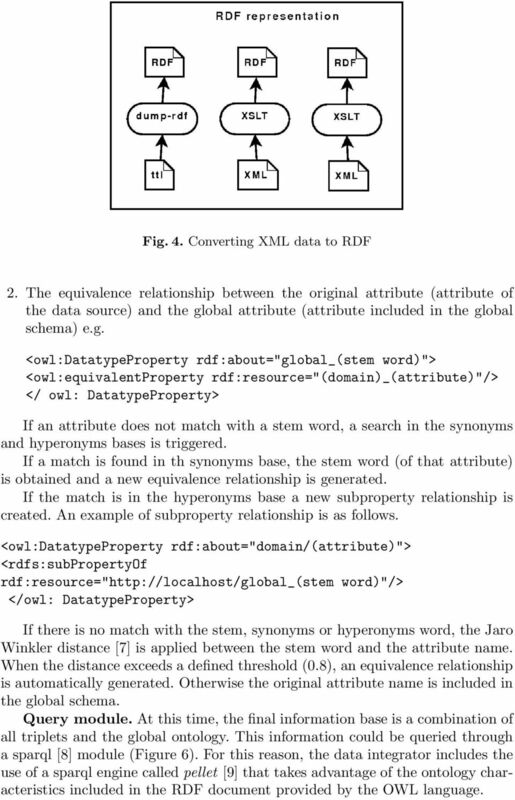 The schema that describes this RDF data is the global ontology. 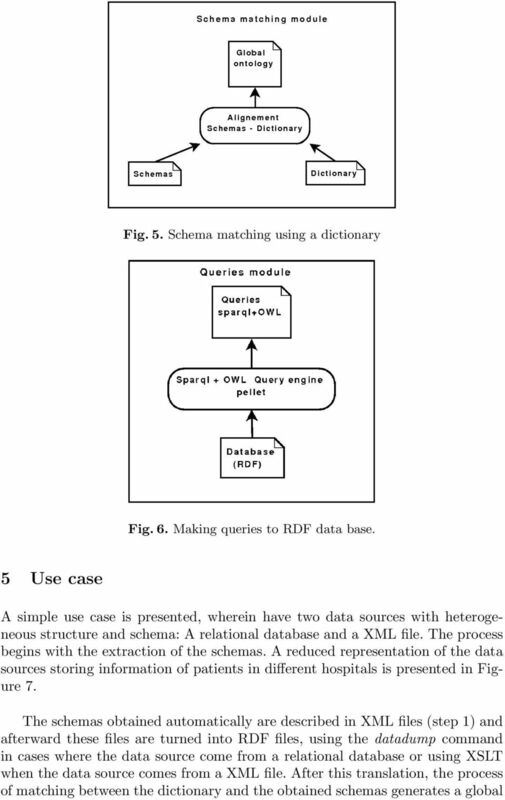 With the scheme represented as Ontology and the data represented in RDF, it is possible to query the global information using the sparql language. In this way, we obtain transparency at the moment of accessing all the mixed information, thanks to the automatically generated OWL rules. An example of this transparency can be seen in the following query: What is the address of the patient Armando Perez? For answering this query using a SQL statement in a relational data base, it is necessary to specify the name of the attribute address and ignore the fact that attributes such as street, stnumber and cityarea together represent an address. 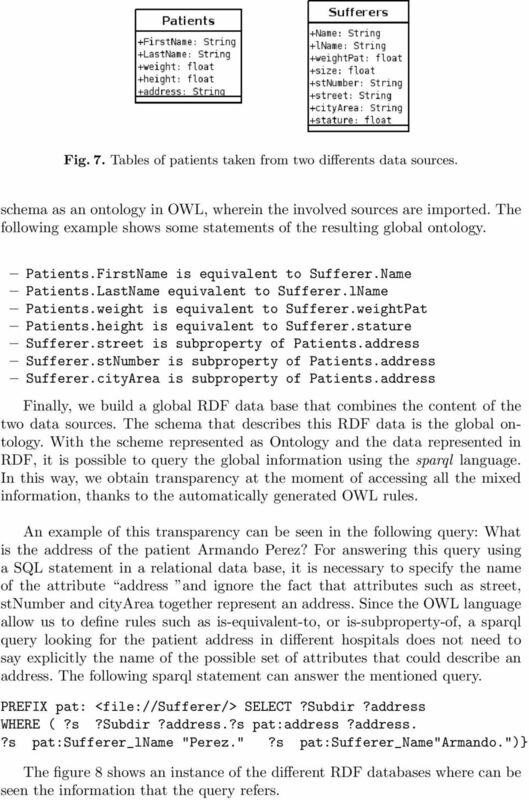 Since the OWL language allow us to define rules such as is-equivalent-to, or is-subproperty-of, a sparql query looking for the patient address in different hospitals does not need to say explicitly the name of the possible set of attributes that could describe an address. The following sparql statement can answer the mentioned query. PREFIX pat: <file://sufferer/> SELECT?Subdir?address WHERE (?s?subdir?address. ?s pat:address?address. ?s pat:sufferer_lname "Perez. "?s pat:sufferer_name"armando.")} 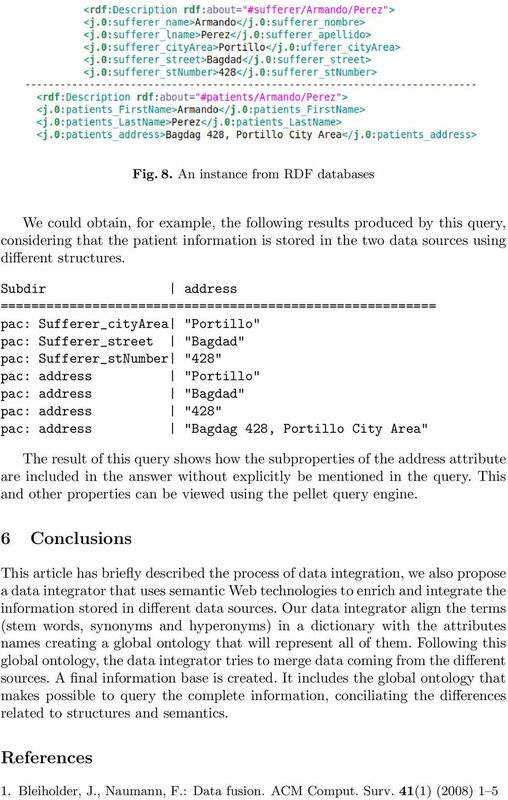 The figure 8 shows an instance of the different RDF databases where can be seen the information that the query refers.